Nothing against the proper concert halls of the world, nor the summer-festival stages erected in a field of sun-baked mud every year, but let’s give it up for the venues that split the difference. 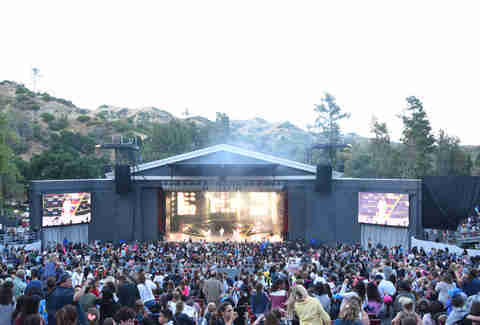 Permanent outdoor amphitheaters that endure the weather and the decades alike are the convertible Mustang of concert venues. There really is nothing like having an actual chair in a roofless palace, either gouged into a mountainside or plopped in the middle of a major city. So before summer turns to fall and you slink back indoors, make time to grab one final show at a jaw-dropping outdoor music venue that’ll have you talking as much about the building as the music. In a good way. The grandaddy of outdoor music venues is this bucket list-worthy pilgrimage site that has been winning hearts and blowing minds for over 75 years. The only venue of its kind in the world, naturally carved into place by two massive sandstone monoliths, is well known for the spiritual vibe floating through the crisp mountain air 6,450 feet above sea level. From The Beatles and Hendrix back in the day to more recently a jam band mecca for acts like the Grateful Dead and Widespread Panic, these days the legendary venue hosts a diverse slate of acts with Gorillaz, Galactic, and Fleet Foxes all rolling into town this September. 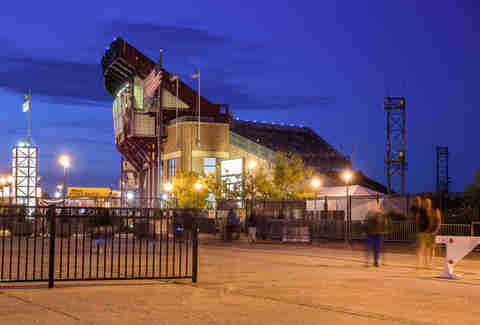 Located just 10 miles west of Denver, this 9,500-capacity venue and National Historic Landmark feels like another world. It’s also a gorgeous free park owned by the City of Denver, so stop by in between shows and replenish your chi with activities like hiking, mountain biking, and yoga. Can anyone resist not calling this place “gorgeous”? No. No, you cannot. 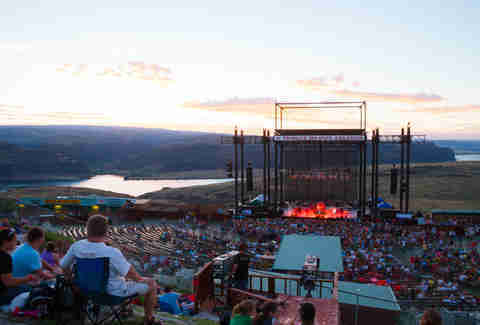 Because this 27,500-seat venue overlooking the Columbia River about 150 miles east of Seattle is a drop-dead stunner. Opened in 1985 as a small-scale winery, it evolved into a crown jewel of the Live Nation empire. It’s so beautiful it makes you want to pitch a tent and stick around for a while... which is why the venue allows on-site camping with a concert ticket for an additional (and totally worth it) fee. Best known as the site of the annual Sasquatch! Music Festival, the storied venue this September will welcome a diverse cast of characters as it closes out the season with Guns N' Roses and Above & Beyond. Hey, maybe Axl will stop by your campsite. Weirder things have happened. If you’re looking to impress a date, roll up to this iconic beauty that’s naturally formed into a scenic hillside in the shadow of the Hollywood Sign and surrounding mountains north of LA. 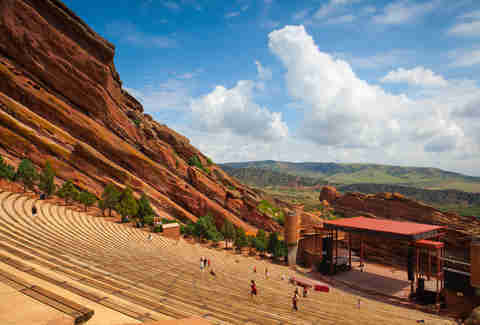 The largest natural amphitheatre in America at 17,500 seats is now 95 years old but shows little sign of aging. While historic acts like Fred Astaire and The Doors are no longer entertaining crowds, you can stop by this September for fireworks paired with the Muppets and musical acts like Steve Winwood and Yo-Yo Ma. The food options include hot dogs and sushi, while seating ranges from benches to plush stadium seating up front. The grounds make a perfect spot to chill before the show, with more than a dozen picnic sites surrounding the venue. You can also get food delivered straight to your seat. If that’s not Hollywood, we don’t know what is. Surviving both Hurricane Sandy and a long line of awkward corporate sponsorships (the former Nikon at Jones Beach Theater is now officially Northwell Health at Jones Beach Theater), this classic Long Island venue is an NYC road trip tradition that this summer is welcoming acts like Sammy Hagar and Jackson Browne to its scenic Jones Beach State Park location. The 15,000-seat Live Nation-owned venue has come a long way since opening in 1952 to host musicals like The Sound of Music. These days the sound of its music leans quite a bit louder with a crowd that is often mullet-friendly, but that in no way diminishes the sheer joy of taking in a live show on the waterfront in a setting unlike anything in the country. The only thing that could possibly make this place better? A moat, which was actually included in the original design with performers reaching the stage by boat. Those who know Baltimore’s favorite sons Animal Collective know Merriweather Post Pavilion as the classic 2009 album from the experimental rock weirdos. Those who don’t just know it as one of the coolest venues on Earth, plopped in the middle of 40 acres of preserved woods about 20 miles southwest of Baltimore. September welcomes rock acts like Sturgill Simpson and Young the Giant, who take to the stage in this utterly unique Frank Gehry-designed venue to rock a 19,000-strong crowd, who bob to the music in between sticks of candied bacon and games in the on-site “music pinball arcade.” The venue’s nods to nature are impossible to overlook, with stage lights powered by solar panels and a vibe fitting somewhere in between Red Rocks and Camp David. 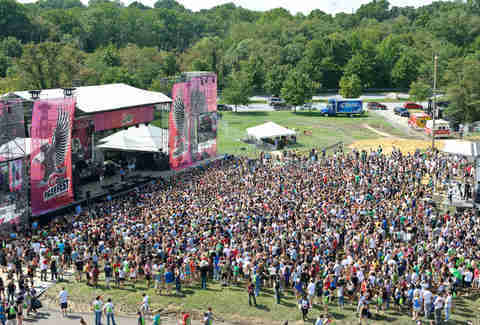 While Lollapalooza gets all the attention in Chicago’s nearby Grant Park, this open-air treasure flies more under the radar as one of the country’s most beautiful (and accessible) concert sites. 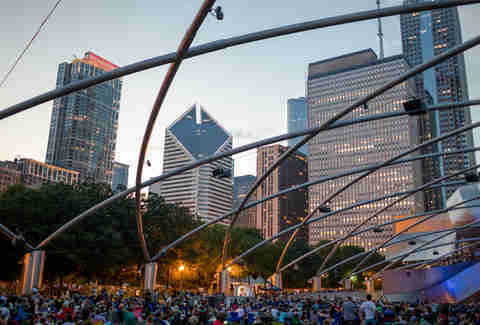 Located in Downtown Chicago’s Millennium Park, this 11,000-capacity venue hosts a range of events: free rock shows during summer (this year’s lineup featured acts like Drive-By Truckers and Wild Belle), a summer film series, classical concerts, dance competitions, the works. This September the venue welcomes the Chicago Jazz Festival and World Music Festival Chicago, proving that summer festival season in Chicago has no quit in its game. Grab a drink on the sunny outdoor deck at the Park Grill before the show, spread a blanket on the lawn in front of the Frank Gehry-designed stage, or wander the grounds afterwards via trails through gardens and a walking path to the lakefront. Colorado is blessed with an overabundance of jaw-dropping outdoor venues, and A+ stages are a common sight at most ski resorts in the area. 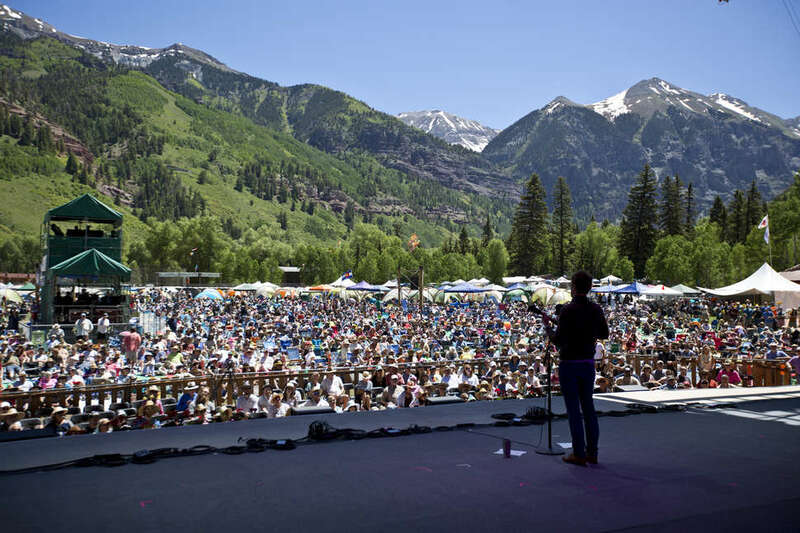 You’d still be hard-pressed to find a better place on Earth that matches the sheer beauty of the Fred Shellman Memorial Stage in Telluride’s Town Park. The stage itself is basic if unspectacular, but the environment in which it sits is the true star. 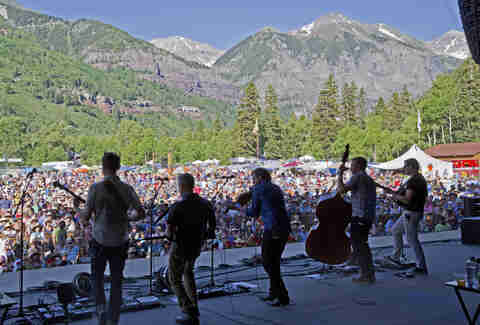 With a lush green forest canopy and snow-capped mountain peaks everywhere you look, the main public park in this spectacular mountain town is busy with festivals throughout the year, including the annual Telluride Blues & Brews Festival rolling into town in mid-September. Buy your ticket now, ask questions later. In case you didn’t learn this from educational films such as Get Him to the Greek, this 5,800-seat venue in LA’s Griffith Park is modeled after an ancient Greek temple. But Socrates never had it this good. 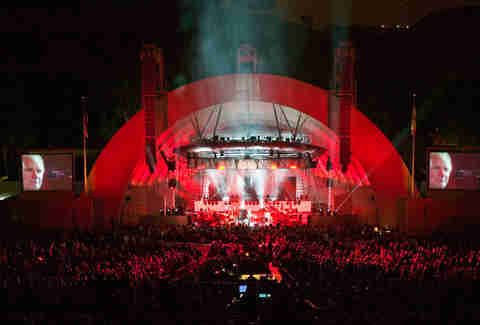 Offering a bit more of a low-key vibe than the nearby Hollywood Bowl, the Greek is welcoming an array of top indie talent this fall including Explosions in the Sky, Future Islands, The Shins, Father John Misty, and The War on Drugs. (But don’t worry, you can still see Tom Jones and Kenny G!) Opened in 1930 and once used a military barracks during WWII, the City of Los Angeles-owned venue offers great sightlines and an intimate vibe surrounded by parkland. The season extends through October 17, so grab a seat under the stars and enjoy live music the way it was meant to be experienced: like a total baller. Jay Gentile is a Thrillist contributor and world traveler who once snuck into Red Rocks on an expired photo pass (shh, don’t tell). Follow @innerviewmag.